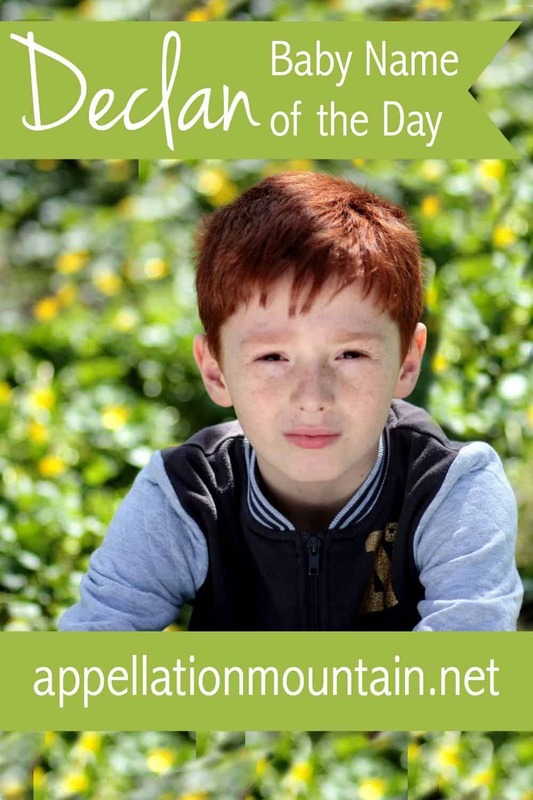 Declan is an Irish heritage choice leaping up the popularity charts throughout the English-speaking world. 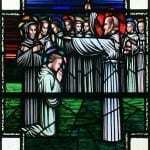 Before Saint Patrick arrived in Ireland, the future saint Declan established a monastery at Ardmore. The ruins are still a destination for pilgrims, all these centuries later. Unlike the Roman-born Patrick, Declan was Irish by birth, born in Munster. Some reports make him a prince of the Déisi, an ancient Gaelic people who ruled the area. Like several of his countrymen, he traveled to Rome for an education, and was also ordained there. If it’s true, he’s one of several religious leaders who brought Christianity to Ireland before Saint Patrick. The name’s meaning is lost, though it’s often given as “man of prayer.” Other accounts link it to the word dag – good – and lan – full, which gives the meaning “full of goodness.” The latter is reported by Baby Names of Ireland. Head to the UK, and Declan has always been reasonably familiar. As recently as 2004, the name still ranked in the British Top 100. In the US, the name debuted in the Top 1000 in 1998, just as Brian, Ryan, and even Brendan were entering dad name territory, and a few years before we reached peak Aiden. The likely reason 1998 was Declan’s year? In 1997, Richard Gere played a former Irish Republican Army sniper by the name in The Jackal. Gere’s character reluctantly agreed to help the FBI and Russian intelligence hunt down an assassin. It’s not just that Declan is Irish, though American parents have been embracing those names for decades. It also helps that the name is two syllables, ending in n, just like Mason, Logan, Ethan, Dylan, and a long list of other favorites with all sorts of origins. By 2011, the name was in the US Top 200. As of 2014, it was poised just outside the current Top 100. The Jackal might have introduced Declan to an American audience, but it wasn’t the first use of the name. It’s the given name of London-born musician Elvis Costello, already well known in the US by the late 1990s. It’s also the full name of BBC television presenter Dec Donnelly, best known as half of Ant and Dec. The duo has hosted everything from children’s television to reality competitions like Britain’s Got Talent. Television has given us characters by the name on Kyle XY, Degrassi, Mysterious Ways, and, most notably, Revenge. The Revenge character is the teenaged half-brother of bar owner Jack, so the name is actually a plausible choice. Cyndi Lauper used the spelling Declyn for her son, born in 1997. In 2014, Fall Out Boy lead singer Patrick Stump gave the name to his firstborn with wife Elisa Yao. Declan: Future Top 100 Name? Now, with the name at #122 as of 2014, it seems likely that Declan is destined for the Top 100. That’s not necessarily a dealbreaker. It’s still far less common than many an Irish heritage option. If you’re looking for a familiar, but not very common name for a son, Declan remains one to consider. What do you think of Declan? Is this name headed for the US Top 100? This post was originally published on March 10, 2009. It was substantially revised and re-posted on March 28, 2016. 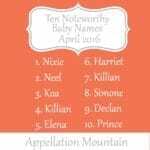 I really liked Declan when we were choosing my son’s name a few years ago, but it’s fast rise in popularity wasn’t my favorite. We went with Devlin instead (Dev for nickname), which sounded similar but felt more unique for our corner of the world. We love it! My 8 year old boy is Declan… we’re in California. We have run into two or three others with the name, but it is typically new to most folks. I’m half Irish and my husband is 1/3. It’s a great name. Sturdy but Romantic. And Different! My boy has three Matthews in his class and there are so many Tylers and Jacobs. All great names, but just too over used! This may sound weird, but my English teacher’s son is named Declan, and the his older son is named Liam. They are very Irish, clearly. But that was the first I heard the name, and now that I’ve had a school year to get used to it, it has definitely grown on me. So, I’m confused – how is this meant to be pronounced? DEE-clan or DEK-lun or DEK-lan? I’ve always wondered. Despite not knowing how to pronounce it, I’ve always liked this name. It sounds debonair yet sturdy and masculine. I also like Lachlan, which has a similar ring. Sarah, you’re right! I have a friend Sara who says the same thing. Smith, though – really? There’s another way to spell Smith?! The thing with Deaglan is that as soon as I met his dad, I thought, “Oh, I get it.” I don’t think he’ll have any trouble explaining why he has the authentic Gaelic spelling, even if Declan becomes very, very popular – and spawns Decklin, etc. D’Lila, though – yeah, that’s just “to make it more unique.” Ahem. Kat, I’d say DEK lan is the closest to the correct pronunciation. It’s how Deaglan’s parents say his name, too, though there’s a hint of something else in his Irish father’s (charming) accent. I can see perhaps it would be easier for the child if he doesn’t have to tell every one how to spell and pronounce his name but by no means do I think it is cruel. Nor do I think it is an act of kindness to give them the english spelling. Even being a Sarah people constantly ask me if its spelt with a ‘h’ or without. I even recall a friend with the surname ‘Smith’ being asked how to spell it?!?! Interesting that Declan generates such a wide range of reactions. I expected him to get more of an “eh” reaction. Sarah, you raise an interesting question about the spelling. I’ve been thinking about this a lot lately, especially as I ran across an Aleksandra because “we’re Russian.” (Which, okay, they were. But about two generations back. On one side.) It seems kind to give your child the more obvious English spelling for their name. Except in Declan’s case, could it be Decklin? I think not, but dozens of Kaitlyns, Katelyns and Catelyns probably have some thoughts on the topic. I like Declan. It’s a solid name. It has a history and a nice sound to it. We have friends whose son is called Declan; they are in the UK… no surprise there, I suppose. It’s a name I haven’t heard here in the states, but I’m in the South and not in, say, Boston or Chicago, so maybe that’s why. In any case, I like Declan as a choice for a baby boy. Thanks Verity! I love Declan because of my Elvis. I don’t know if I’d use it, but it’s grand. It’s a green to me, and just lovely. I’m gun shy as it comes to popularity, though. I’m rather impartial to Declan, really. I can see his appeal, and he is almost comforting, but I’ve met a few Declans in my life, and I’ve not liked a single one! I can’t help feeling that Declan is trying too hard to be different. He feels so wife beater-ry to me. Far too gruffly masculine. I tend to prefer names with a bit more of a cutesy feel. Not too cutesy though like Junior for example. Just a bit more gentle than Declan. I can understand if your using him for his Irish connections though. But wouldn’t you use the tradtional spelling then? Oliver and Walter and Hugo seemed wildly out there to me at first. Ryder and Maverick and Wilder are in common use. You think Declan is strange? Have you been around a group of young children lately? I don’t think I’m a big fan of Declan, very roman catholic the name which isnt my thing. I don’t think you can do this name if you don’t have irish roots. I like Declan! He’s snazzy, handsome & warm. I hear him a fair bit when I hit Boston, but not as much as say, Finn or Owen and while Cillian, Lorcan & Malachy are three I like better, I have no complaints about Declan. He’s lovely and anything that reminds me of Elvis Costello is a grand thing! Declan has a neat history, I never knew there was a St. Declan (so there! Pop) even with my Parents and their love of the Bible/Church and Saints he was overlooked back in the 70’s here, I would guess. I know how much Cat loved Declan and I hope she gets a chance to use it someday. I know I’ll forever associate Declan with her! He gets a solid and enthusiastic :thumbsup:! Declan’s aces!